Attorney referrals to and Co-Counseling with Trial Lawyers You Can Trust. Genie Harrison and her team of lawyers have decades of experience in handling complex litigation and trials. 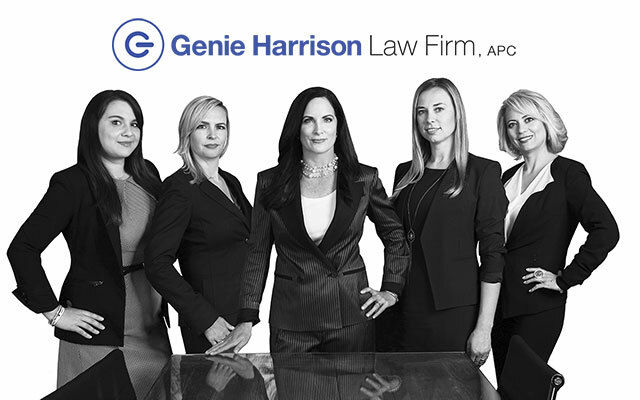 For a consultation on an employment or sexual harassment case, contact us at (213) 805-5301 or email Ms. Harrison directly at genie@genieharrisonlaw.com. Many of our cases come from referrals from other attorneys who understand that employment litigation can be complex and difficult to resolve unless you have experienced representation in this field of practice. McClure v. City of Long Beach — Genie represented plaintiffs in a federal civil rights and Fair Housing Act case against the City of Long Beach and other city officials for disparately citing plaintiffs for building conditions in order to stop the conversion of residential homes for the care of Alzheimer’s disease victims. The trial and deliberations lasted for almost a year, and resulted in a $22.5 million plaintiffs’ verdict, the largest award ever returned against the City of Long Beach. Lee v. City of Los Angeles — Genie fought and tried this discrimination, harassment, and retaliation case on behalf of a Black, female, lesbian firefighter. During closing argument Genie told the jury that “[Lee] was crying for [their] help… All she wanted to be was a firefighter. She never will be again.” Genie’s passionate representation resulted in at $6.2 million verdict against defendants. Ewing v. City of Los Angeles — Genie was asked to come in to try this federal civil rights case where police detained a plaintiff lawfully driving a vehicle and handcuffed her too tightly for an extended period of time, causing severe nerve damage. A unanimous jury found that the Los Angeles Police Department acted with excessive force and in reckless disregard for Ewing’s rights. Bustillos v. Villa Blanca — Genie Harrison was brought in to co-counsel and try this sexual harassment, discrimination, retaliation, and assault and battery case just before trial. After showing that defendants engaged in the malicious destruction of evidence in an effort to avoid liability, the jury awarded economic and punitive damages. After an attorneys’ fee award, about which Judge Michael Linfield stated, “it is important to award ample fees in civil rights cases such as this so that plaintiffs will be encouraged to come forward,” defendants were ordered to pay close to $1.6 million. The trial attorneys at Genie Harrison Law Firm are just as passionate about the cases they co-counsel and try for other attorneys as those they have litigated from inception. We pay referral fees to other attorneys in accordance with the California Rules of Professional Conduct and the State Bar of California. Contact us with your employment cases or sexual harassment cases at (213) 805-5301 or email Genie Harrison directly at genie@genieharrisonlaw.com. We can help. We are trial lawyers you can trust. Our multilingual staff speaks, Spanish, Armenian, Arabic, Farsi and French. We are located across the street from Pershing Square in downtown Los Angeles, served by the Pershing Square station of the Metro Red and Purple lines. We validate parking at Pershing Square and in the PacMutual Building. Click here for directions on Google maps. Read about Damages Genie, the software solution created by Genie Harrison to help attorneys maximize non-economic damages for their clients.